On Multicultural Children’s Book Day we are pleased to celebrate books written by or in collaboration with people of various cultures. Knowing this collection should be larger, we encourage submissions from authors and illustrators from every background. This is the fourth year running for Multicultural Children’s Book Day mission is to raise awareness for the children’s books that celebrate diversity, and to get more of these books into classrooms and libraries. You can find out more about this very important initiative here. Here are some of our titles that we recommend to those looking to introduce new, diverse books to their bookshelves. What did you like about the book? This is the story of one girl, Tuyet, and her journey from an orphanage in Saigon to Canada during the Vietnam War. Tuyet could not remember life outside the orphanage where she is kept indoors and helps take care of the younger children. At eight, she suffers from the effects of polio, and does not feel she will ever be adopted. In 1975, Tuyet is among the orphans on the last transport out of Saigon as the North Vietnamese take control. She makes herself useful on board the plane as well as in the orphanage in Canada. She is adopted by the Morris family, who already have a biological daughter and two adopted children. At first, Tuyet cannot believe that she is anything more than a helper, but little by little she realizes that she really is a daughter and a sister. Black and white photographs and documents supplement this biographical tale. Told from the point of view of this eight year old girl, the story is quite informative and compelling. Readers who enjoy biographies will find much to admire in Tuyet. To whom would you recommend this book? This is a good choice to supplement lessons on the Vietnam War. Children who were adopted will identify with Tuyet’s story. It would also be a good choice for a biography assignment. Who should buy this book? Public libraries and elementary school libraries. Click here to read more of this review. 40 years ago this month, approximately 3,000 orphans, mostly babies, were hurried onto airplanes departing Saigon (now Ho Chi Minh City). The city was about to fall to the North Vietnamese forces, and humanitarian organizations worried that many orphans, especially those fathered by American soldiers or those with disabilities, would be at risk. Families in Canada, the United States, and other nations signed up to adopt the evacuated orphans. “It was a revelation to finally discover Tuyet. I had been wanting to write about the airlift rescue for quite some time and had wanted to write the story from the point of view of one of the rescued children. But because most of those rescued were babies at the time, it meant my days were spent interviewing adoptive parents and the story from their perspective. Interesting and poignant, yes, but not the story I wanted to tell. And then, through the grapevine, I found out that the oldest orphan on that last flight to Canada lived in my own home town. Not only that, but she lived around the corner from my old house and her kids went to the same school that my son had gone to. I looked up her phone number and called out of the blue. She was receptive and friendly and agreed to meet. We chose a local Vietnamese restaurant. Pajama Press is pleased to announce that all three of our titles nominated for this year’s Ontario Library Association Forest of Reading® awards have been recognized as winners or honour books in their categories. No Shelter Here: Making the World a Kinder Place for Dogs by Rob Laidlaw received The Silver Birch Non-Fiction Award™ in today’s ceremony at the Toronto Festival of Trees. 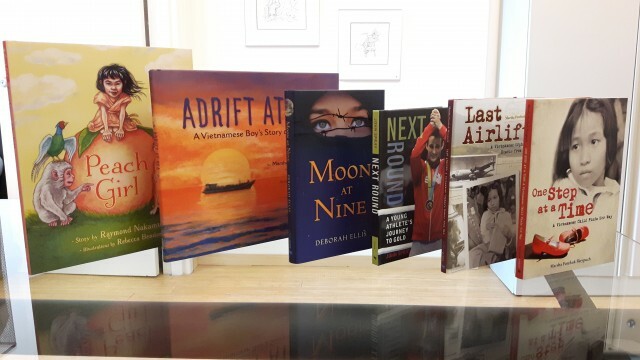 Yesterday at The Red Maple Non-Fiction Award™ ceremony Marsha Forchuk Skrypuch’s Last Airlift: A Vietnamese Orphan’s Rescue from War was announced as an honour book. Don’t Laugh at Giraffe by Rebecca Bender is also an honour book for the Blue Spruce Award™. In 2012 Rebecca’s first picture book, Giraffe and Bird, was the winner of The Blue Spruce Award™. The Forest of Reading® is a reading program run by the Ontario Library Association. Each year, over 250,000 participants read a shortlist of books in their age category and vote for their favourites. Pajama Press extends our most sincere congratulations to Rob Laidlaw, Marsha Forchuk Skrypuch and Rebecca Bender. We are thrilled to be a part of this exciting program. 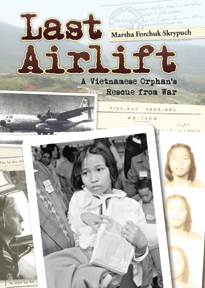 Congratulations to Marsha Forchuk Skrypuch, whose book Last Airlift: A Vietnamese Orphan’s Rescue from War has just won the Red Cedar Information Book Award. More than 2,000 votes were cast by students across British Columbia for this year’s Red Cedar Awards. To learn more, visit the Red Cedar website. Last Airlift has also been nominated for the OLA Forest of Reading Red Maple Nonfiction Award, to be announced on Wednesday, May 18 at the Festival of Trees in Toronto. Pajama Press is delighted and honoured by the reception this wonderful title has received. We are delighted to announce that Last Airlift: A Vietnamese Orphan’s Rescue from War by Marsha Forchuk Skrypuch is a Top 5 Finalist for the 2012 CYBILS (Children’s and Young Adult Bloggers’ Literary) Awards in the category of Non-Fiction (MG/YA). The title is in good company with Bomb: The Race to Build – and Steal – the World’s most Dangerous Weapon (Steve Sheinkin), Moonbird: A Year on the Wind with the Great Survivor B-95 (Phillip M. Hoose), Titanic: Voices from the Disaster (Deborah Hopkinson) and Temple Grandin: How the Girl who loved Cows Embraced Autism and Changed the World (Temple Grandin).